As with many other microsoft errors, this is completely misleading (unless you’ve been messing up your configuration data – but this is a newly installed site). By now, you are probably half way into your web.config, and trying to remember where that mystical machine.config is located. You might even have started to go through all directories on your machine in the search for another web.config thats somehome conflicting. Stop looking. It’s not conflicting. And relax – you didn’t do anything wrong…yet. 1) IIS was installed after ASP.NET, and it’s not really sure what to do with ASP.NET code. Solution: In a command prompt run aspnet_regiis. It’s typically found in “%windows%\Microsoft.Net\Framework\v2.0.50727\aspnet_regiis –i”. Note that you need to run it as Administrator on Vista and Windows 7. In fact, running this can be a cure for many initial web server errors on newly installed asp.net applications. Hit “Ok”, wait for half an hour and then see your web application spring to life. Enjoy! Я - счастливый обладатель Sony Reader PRS-505! Однако взявшись за чтение книг на русском языке, я обнаружила, что формат, в котором можно скачать большинство книг на русском в интернете FB2, не поддерживается моим Reader. Возникла проблема - как сконвертировать FB2 в один из форматов, поддерживаемых Sony Reader (например, PDF). Найденная в интернете веб страничка http://fb2pdf.com/ , которая позволяет сконвертировать формат в PDF, к сожалению, сработала только в первый раз. В остальных случаях конвертация занимала слишком долгое время. К счастью, мой муж - волшебник, и по совместительству программист, создал программу, которая позволяет сконвертировать FB2 в PDF в считанные секунды, и он безвозмедно предлагает ее всем любителям (электронных) книг на русском языке. After a couple of weeks of attending various web content management conferences (GilbaneSF and Web Content in Chicago) and talking to a lot of people more clever than I, I figured that a summarizing blog post might be in order. These are some of the trends I spotted. Facebook, Twitter, Flickr have paved the way – now everybody wants user generated content. It seems as if most companies has figured out that visitors that contribute with content are dedicated visitors – and who wouldn’t want those?! Most CMS vendors has forums / blog functionality built-in – and a handful have gone all the way with full-sized communities containing clubs, my-page, videos, friends, social graphs, you name it (including EPiServer). A lot of the stuff isn’t new – forums and public profiles were common even during those delightful years of BBS’in in the eighties and early nineties. And during the Web 2.0 era a few years ago it boomed. It’s first now, however, that people are really considering when to use which features – and when not to use it. Perhaps it is really time to start use this technology not just “because we can” but “because it makes sense”. This might just be when Web 2.0 turns profitable. Personalization has been hot for a couple of years now. Pioneered by companies such as Amazon, Netflix, etc. companies are now starting to see real business value in personalizing their content. The term is used to cover a lot of different technologies and usages however. Everything from changing the language of the website to automatically suggesting products that the current user is interested in – is some kind of personalization. Even silly things such as letting the user customize the style or background color of the website is getting popular. Again Facebook has turned out to be somewhat of a thought leader – adds shown there are totally personalized to your characteristics increasing the possibility of a click/purchase. Most CMS vendors have some sort of way to enable simple personalization – like the ability to save key/value fields about each visitor and that way allow the implementation to build up a profile. But after what I’ve been able to find out nobody has gone beyond that – which means that most of the personalization work done is done in the actual implementations of websites and not as a standardized feature in the content management systems. In a few cases the search engines used on the websites actually comes with more build-in personalization features than the CMS. Mostly due to the iPhone and increased 3G/HDSPA/edge coverage the web is no longer something that’s just meant for regular desktop/laptop computers. In fact in Asia, most internet usage is coming from mobile devices. So every CMS vendor is coming up with strategies on how they can deliver content across platforms. To be able to manage mobile content is a MUST these days – and the approaches vary from automatically transforming the html to supporting multiple rendering methods. A series of niche-players purely focusing on extending the mobile abilities of mainstream CMSs have already emerged. I remember a day, not too long ago when I learned that a major danish company had an entire department of secretaries hired to take printouts from their ordering system and type them into their hour-management system, their CRM system and their invoicing system manually. None of the systems could interact in spite of them being based on the same platform – heck, even on the same servers. Hopefully we’ll soon see the end of those days. There is a lot of focus on interoperability and connecting different systems – especially in the content management industry. Vendors are opening up their API’s, supplying web services and even building connectors to various systems. Most popular are connectors to enterprise search, sharepoint and crm systems like Salesforce and Microsoft CRM. Many implementations feature integrations to backend commerce-systems, product databases and invoicing systems – and we are starting to see a tendency to more standardized connectors as the systems mature. EPiServer went down that road long ago, with Virtual path providers, Content Channels, open API, Microsoft CRM connector, Salesforce connector, EPiMore partner program and in version 5.2 we came out with PageProviders to connect live to any other datasource. It’s easy to understand the popularity of this – ROI’s are easily measured in the number of work hours saved from being wasted on manually synchronizing data. As a result of these efforts we are also seeing new protocols and standards emerge. Since it was proposed in august there has been a lot of buzz around CMIS (Content Management Interoperability Services) and many vendors are starting prototyping projects to be CMIS compliant when/if it officially becomes a standard. I talked to quite a few people about it and of course people are afraid that it will suffer from YASS (Yet Another Standard Syndrome) and die down – but still like the idea of a common way to integrate with other ECMs – or let other systems integrate with theirs. Together with a handful of others I’ve started the NCMIS project recently to see if we can scrape together a cross-vendor team interested in making a shared, open source .NET library/toolbox to help everybody adapt their systems to CMIS. Ok – I admit – to call this a trend just yet might be taking a step too far. But I predict that this is a trend we’ll see soon. When Google Wave launches for real I could imagine people getting used to constantly collaborate on construct contents. Today most CMS systems lack features that allows concurrent editors to actively work together on creating a piece of content – at most there’ll be a check-in / check-out functionality to avoid overriding each others changes. But wait and see! The last trend I’ll mention is probably one of the most important trends. Today it’s not longer enough for a feature on a website to be cool in a geeky sort of way. Today you need to proof that it’s cool. Most vendors today integrate with some sort of web statistics tool to show basic stats for the website – but we’ll see even more very soon. Many vendors are looking towards marketing engines, A/B testing, landing page optimization as built-in features that will allow website owners to test how well a given change to a website works on the visitors. Sometimes even simple changes in the text of a link can make the difference between success and failure for a website – and you’ll need to be able to measure it. Perhaps it’s the maturing market and technologies – perhaps it’s the collapse of economy, but measuring & tracking – often realtime – what’s going on on your website is definitely part of the current and future. I just published one of my holiday pet projects on Codeplex. It's a very basic framework for building your own card games in .net. With time, I'll also publish some sample projects, and hopefully even expand the project to include some basic AI logic as well. Even though it's still missing a lot of parts, I've already begun to use it for 2 other pet projects. One is a code competition I plan to put out soon - just looking for price-sponsors now, the other is a web-edition of the classic 500-Rummy card game, a game that I really enjoyed growing up - and still play when I'm vacationing with my family. Card games are an excellent form of entertainment - and remember, there's more than poker and blackjack to life. Just before Christmas I was part of a team that launched WikiX an Open Source Wiki for EPiServer CMS 5 R2. Even though it's still in beta, it is actually really nice with a lot of cool features. WikiX is based on some of the thoughts and ideas presented here: http://allantech.blogspot.com/2008/10/wiki-vs-cms-difference-is-psychological.html. 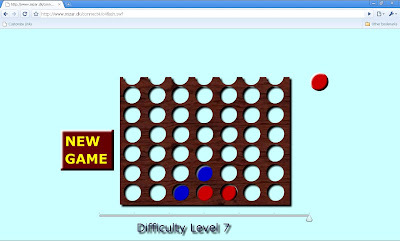 Inspired by Giorgio Sardo who used my old Connect4 code to demonstrate moving a c# game to Silverlight for Mobile (when will you put that code online, Giorgio?) in a PDC 2008 session, I decided to use the same code as the basis of a project I had to do for a flash course last year. This time, I didn't migrate all of the code, but rather made the flash talk to a back-end c# web service that calculated computer moves. I know it's still a bit buggy - but some of you out there might enjoy it. While making it I found what could seem like a bug in ActionScript 3 - making it quite difficult to drag and drop nested objects....But I might share more about that later. Try the original plain html here. Try the new flash version here. Code and written project will be available later.